The Battle of Appomattox Court House (Virginia, U.S.), fought on the morning of April 9, 1865, was one of the last battles of the American Civil War (1861–1865). It was the final engagement of Confederate States Army General-in-Chief, Robert E. Lee, and his Army of Northern Virginia before it surrendered to the Union Army of the Potomac under the Commanding General of the United States, Ulysses S. Grant. Lee, having abandoned the Confederate capital of Richmond, Virginia, after the nine and one-half month Siege of Petersburg and Richmond, retreated west, hoping to join his army with the remaining Confederate forces in North Carolina, the Army of Tennessee under Gen. Joseph E. Johnston. Union infantry and cavalry forces under Gen. Philip Sheridan pursued and cut off the Confederates' retreat at the central Virginia village of Appomattox Court House. Lee launched a last-ditch attack to break through the Union forces to his front, assuming the Union force consisted entirely of lightly armed cavalry. When he realized that the cavalry was now backed up by two corps of Federal infantry, he had no choice but to surrender with his further avenue of retreat and escape now cut off. The signing of the surrender documents occurred in the parlor of the house owned by Wilmer McLean on the afternoon of April 9. On April 12, a formal ceremony of parade and the stacking of arms led by Southern Maj. Gen. John B. Gordon to Federal Brig. Gen. Joshua Chamberlain of Maine marked the disbandment of the Army of Northern Virginia with the parole of its nearly 28,000 remaining officers and men, free to return home without their major weapons but enabling men to take their horses and officers to retain their sidearms (swords and pistols), and effectively ending the war in Virginia. This event triggered a series of subsequent surrenders across the South, in North Carolina, Alabama and finally Shreveport, Louisiana, for the Trans-Mississippi Theater in the West by June, signaling the end of the four-year-long war. The final campaign for Richmond, Virginia, the capital of the Confederate States, began when the Union/Federal/Northern Army of the Potomac crossed the James River in June 1864. The armies under the command of Lieutenant General and General-in-Chief Ulysses S. Grant (1822–1885) laid siege to Petersburg, south of Richmond, intending to cut the two cities' supply lines and force the Confederates to evacuate. In the spring of 1865, Confederate States Army Gen. Robert E. Lee (1807–1870), waited for an opportunity to leave the Petersburg lines, aware that the position was untenable, but Union troops made the first move. On April 1, 1865, Maj. Gen. Philip Sheridan's cavalry turned Lee's flank at the Battle of Five Forks. The next day Grant's army achieved a decisive breakthrough, effectively ending the Petersburg siege. With supply railroad lines cut, Lee's men abandoned the trenches they had held for ten months and evacuated on the night of April 2–3. Lee's first objective was to reassemble and supply his men at Amelia Courthouse. His plan was to link up with Gen. Joseph E. Johnston's Army of Tennessee in North Carolina and go on the offensive after establishing defenses on the Roanoke River in southwest Virginia. When the troops arrived at Amelia on April 4, however, they found no provisions. Lee sent wagons out to the surrounding country to forage, but as a result lost a day's worth of marching time. The army then headed west to Appomattox Station, where another supply train awaited him. Lee's army was now composed of the cavalry corps and two small infantry corps. En route to the station, on April 6 at Sailor's Creek, nearly one fourth of the retreating Confederate army was cut off by Sheridan's cavalry and elements of the II and VI Corps. Two Confederate divisions fought the VI Corps along the creek. The Confederates attacked but were driven back, and soon after the Union cavalry cut through the right of the Confederate lines. Most of the 7,700 Confederates were captured or surrendered, including Lt. Gen. Richard S. Ewell and eight other general officers. The delay prevented Lee from reaching the Appomattox station until late afternoon on April 8, allowing Sheridan to reach the station ahead of the Southerners that evening, where he captured Lee's supplies and obstructed his path. Following the minor battles of Cumberland Church and High Bridge, on April 7, General Grant sent a note to Lee suggesting that it was time to surrender the Army of Northern Virginia. In a return note, Lee refused the request, but asked Grant what terms he had in mind. On April 8, Union cavalry under Brig. Gen. and Brevet Maj. Gen. George Armstrong Custer captured and burned three supply trains waiting for Lee's army at the Appomattox Station. Now both of the Federal forces, the Army of the Potomac and the Army of the James, were converging on Appomattox. With his supplies at Appomattox destroyed, Lee now looked west, to the railway at Lynchburg, where more supplies awaited him. However, on the morning of April 8 a battalion of the 15th Pennsylvania Cavalry was detached from Stoneman's Raid into North Carolina and southwestern Virginia and had made a demonstration to within three miles of Lynchburg, giving the appearance of being the vanguard of a much larger force. Despite this new threat, Lee apparently decided to try for Lynchburg anyway. While the Union Army was closing in on Lee, all that lay between Lee and Lynchburg was Union cavalry. Lee hoped to break through the cavalry before infantry arrived. He sent a note to Grant saying that he did not wish to surrender his army just yet but was willing to discuss how Grant's terms would affect the Confederacy. Grant, suffering from a throbbing headache, stated that "It looks as if Lee still means to fight." The Union infantry was close, but the only unit near enough to support Sheridan's cavalry was Maj. Gen. John Gibbon's XXIV Corps of the Army of the James. This corps traveled 30 miles (48 km) in 21 hours to reach the cavalry. Maj. Gen. Edward O. C. Ord, commander of the Army of the James, arrived with the XXIV Corps around 4:00 a.m. while the V Corps of the Army of the Potomac was close behind. Sheridan deployed his three divisions of cavalry along a low ridge to the southwest of Appomattox Court House. At dawn on April 9, 1865, the Confederate Second Corps under Maj. Gen. John B. Gordon attacked Sheridan's cavalry and quickly forced back the first line under Brevet Brig. Gen. Charles H. Smith. The next line, held by Brig. Gens. Ranald S. Mackenzie and George Crook, slowed the Confederate advance. Gordon's troops charged through the Union lines and took the ridge, but as they reached the crest they saw the entire Union XXIV Corps in line of battle with the Union V Corps to their right. Lee's cavalry saw these Union forces and immediately withdrew and rode off towards Lynchburg. Ord's troops began advancing against Gordon's corps while the Union II Corps began moving against Lt. Gen. James Longstreet's corps to the northeast. Colonel Charles Venable of Lee's staff rode in at this time and asked for an assessment, and Gordon gave him a reply he knew Lee did not want to hear: "Tell General Lee I have fought my corps to a frazzle, and I fear I can do nothing unless I am heavily supported by Longstreet's corps." Upon hearing it Lee finally stated the inevitable: "Then there is nothing left for me to do but to go and see General Grant, and I would rather die a thousand deaths." Many of Lee's officers, including Longstreet, agreed that surrendering the army was the only option left. The only notable officer opposed to surrender was Longstreet's chief of artillery, Brig. Gen. Edward Porter Alexander, who predicted that if Lee surrendered then "every other [Confederate] army will follow suit". General, Your note of this date is but this moment, 11:50 A.M. rec'd., in consequence of my having passed from the Richmond and Lynchburg road. I am at this writing about four miles West of Walker's Church and will push forward to the front for the purpose of meeting you. Notice sent to me on this road where you wish the interview to take place. Grant's response was remarkable in that it let the defeated Lee choose the place of his surrender. Lee received the reply within an hour and dispatched an aide, Charles Marshall, to find a suitable location for the occasion. 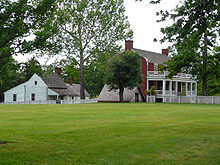 Marshall scrutinized Appomattox Court House, a small village of roughly twenty buildings that served as a waystation for travelers on the Richmond-Lynchburg Stage Road. Marshall rejected the first house he saw as too dilapidated, instead settling on the 1848 brick home of Wilmer McLean. McLean had lived near Manassas Junction during the First Battle of Bull Run, and had retired to Appomattox to escape the war. 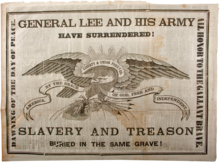 The terms were as generous as Lee could hope for; his men would not be imprisoned or prosecuted for treason. Officers were allowed to keep their sidearms, horses, and personal baggage. In addition to his terms, Grant also allowed the defeated men to take home their horses and mules to carry out the spring planting and provided Lee with a supply of food rations for his starving army; Lee said it would have a very happy effect among the men and do much toward reconciling the country. The terms of the surrender were recorded in a document hand-written by Grant's adjutant Ely S. Parker, a Native American of the Seneca tribe, and completed around 4 p.m., April 9. Lee, upon discovering Parker to be a Seneca, remarked "It is good to have one real American here." Parker replied, "Sir, we are all Americans." As Lee left the house and rode away, Grant's men began cheering in celebration, but Grant ordered an immediate stop. "I at once sent word, however, to have it stopped," he said. "The Confederates were now our countrymen, and we did not want to exult over their downfall," he said. Custer and other Union officers purchased from McLean the furnishings of the room Lee and Grant met in as souvenirs, emptying it of furniture. Grant soon visited the Confederate army, and then he and Lee sat on the McLean home's porch and met with visitors such as Longstreet and George Pickett before the two men left for their capitals. Chamberlain's account has been questioned by historian William Marvel, who claims that "few promoted their own legends more actively and successfully than he did". Marvel points out that Chamberlain in fact did not command the federal surrender detail (but only one of the brigades in General Joseph J. Bartlett's division) and that he did not mention any "salute" in his contemporary letters, but only in his memoirs written many decades later when most other eyewitnesses had already died. At the surrender ceremonies, about 28,000 Confederate soldiers passed by and stacked their arms. The Appomattox Roster lists approximately 26,300 men who surrendered. This reference does not include the 7,700 who were captured at Sailor's Creek three days earlier, who were treated as prisoners of war. 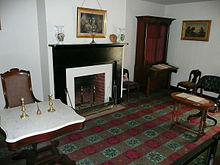 Panoramic image of the reconstructed parlor of the McLean House. Ulysses S. Grant sat at the simple wooden table on the right, while Robert E. Lee sat at the more ornate marble-topped table on the left. The items in the room are exact reproductions, the original chairs and wooden table are in the collection of the Smithsonian and the marble table in the Chicago History Museum's collection. While General George Meade (who was not present at the meeting) reportedly shouted that "it's all over" upon hearing the surrender was signed, roughly 175,000 Confederates remained in the field, but were mostly starving and disillusioned. Many of these were scattered throughout the South in garrisons or guerrilla bands while the rest were concentrated in three major Confederate commands. Just as Porter Alexander had predicted, as news spread of Lee's surrender other Confederate commanders realized that the strength of the Confederacy was gone, and decided to lay down their own arms. Gen. Joseph E. Johnston's army in North Carolina, the most threatening of the remaining Confederate armies, surrendered to Maj. Gen. William T. Sherman at Bennett Place in Durham, North Carolina on April 26, 1865. The 98,270 Confederate troops who laid down their weapons (the largest surrender of the war) marked the virtual end of the conflict. General Taylor surrendered his army at Citronelle, Alabama in early May, followed by General Edmund Kirby Smith surrendering the Confederate Trans-Mississippi Department on May 26, 1865 near New Orleans, Louisiana. Upon hearing about General Lee's surrender, Nathan Bedford Forrest, "The Wizard of the Saddle", also surrendered, reading his farewell address on May 9, 1865 at Gainesville, Alabama. General Stand Watie surrendered the last sizeable organized Confederate force on June 23, 1865 in Choctaw County, Oklahoma. There were several more small battles after Lee's surrender. The Battle of Palmito Ranch on May 12–13, 1865, is commonly regarded as the final land battle of the war. Commander James Iredell Waddell surrendered CSS Shenandoah on November 6, 1865, at Liverpool, Great Britain. Lee never forgot Grant's magnanimity during the surrender, and for the rest of his life would not tolerate an unkind word about Grant in his presence. Likewise, General Gordon cherished Chamberlain's simple act of saluting his surrendered army, calling Chamberlain "one of the knightliest soldiers of the Federal army." This statement by Gordon tends to contradict historian William Marvel's perception of the event. The Civil War Trust (a division of the American Battlefield Trust) and its partners have acquired and preserved 512 acres (2.07 km2) of the battlefield. ^ a b c Williams. ^ a b Winik, p. 182. ^ a b Winik, p. 184. ^ a b Winik, 191. ^ Keegan, John (2009). The American Civil War: A Military History. Vintage Books. p. 375. ISBN 978-0-307-27314-7. ^ Eicher, The Longest Night, p. 820 says that Lee's General Orders No. 9 was read to the troops, but not by Lee. ^ William Marvel, Lee's Last Retreat, p. 193. ^ William Marvel, A Place called Appomattox, p. 260-262 and 359-359; and Lee's Last Retreat, p. 191-195. ^ Winik, p. 197; Eicher, The Longest Night, p. 821, states 26,765 captured Confederates were paroled at Appomattox Court House. Calkins, p. 187, states 1,559 cavalrymen turned in their weapons on April 10, on p. 188, 2,576 artillerymen surrendered on April 11, and, on p. 192, 23,512 infantry surrendered on April 12, for a total of 27,647. Bodart, Gaston (1908). Militär-historisches Kriegs-Lexikon, (1618–1905). Stern. Davis, Burke. To Appomattox: Nine April Days, 1865. New York: Eastern Acorn Press reprint, 1981. ISBN 0-915992-17-5. First published New York: Rinehart, 1959. Korn, Jerry, and the Editors of Time-Life Books. Pursuit to Appomattox: The Last Battles. Alexandria, VA: Time-Life Books, 1987. ISBN 0-8094-4788-6. Lee, Fitzhugh, General Lee; Great Commanders, D. Appleton and Company, 1894. Marvel, William. A Place called Appomattox. Chapel Hill: University of North Carolina Press, 2000. Marvel, William. Lee's Last Retreat. The Flight to Appomattox. Chapel Hill, The University of North Carolina Press, 2002. ISBN 978-0-8078-5703-8. Southern Historical Society. The Appomattox Roster; Vol.15, The Southern Historical Society Papers. Williams, Joe (2004-09-22). "The Appomattox Campaign; March 29 – April 9, 1865". National Park Service. Retrieved 2012-08-21. Marvel, William. A Place Called Appomattox. Chapel Hill: University of North Carolina Press, 1999. ISBN 978-0-8078-2568-6. Wikimedia Commons has media related to Battle of Appomattox Court House. Confederate Surrender at Appomattox, Virginia, April 10, 1865.